You can’t go wrong with homewares for Mother’s Day, especially if you have a stylish eye for zhuzhing (yes, it’s a word) up your surrounds. If your family don’t quite have the same eye for it as yourself, be sure to let them know of this gift guide! Short on vases and don’t know what to do with all those amazing Mother’s day bouquets you expect to be receiving? Or maybe the more realistic blooms picked from your own (or the neighbour’s) garden? 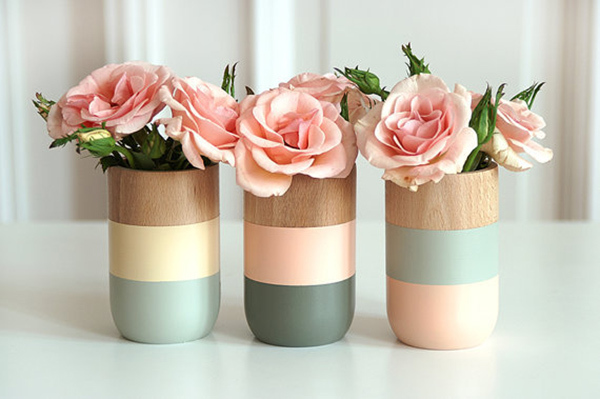 These small Pastel Painted Vases are divine and come in a set of three for $60 from Anrol Designs. Sentimental gifts are always a winner and I’m pretty sure having a favourite photo transformed into a canvas print would be quite spectacular. 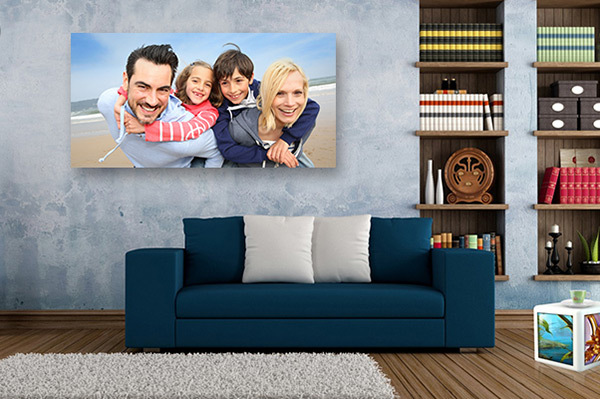 Canvas Printers is a fabulous service that enables you to do just that – turn your digital photographs into canvas wall art and it’s a super easy process, thanks to Canvas Printers step by step guide. Prices start from just $19.50, so start hunting for the perfect photo! 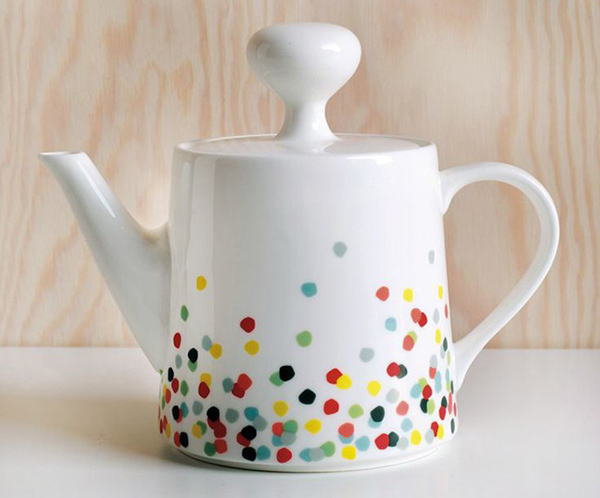 How about a cute and ditzy teapot such as this Littlephant Confetti Teapot by Swedish designer Camille Lundsten. This fun teapot has a 1.5 litre capacity, perfect for a lazy Mother’s Day brunch with friends. Beautifully gift boxed, the Littlephant Confetti Teapot is priced $99.95 from Lark. Never forget a birthday again (though with children, I’m sure they won’t let you) with this genius idea – a Family Birthday Calendar handcrafted by Imogen’s Angels. 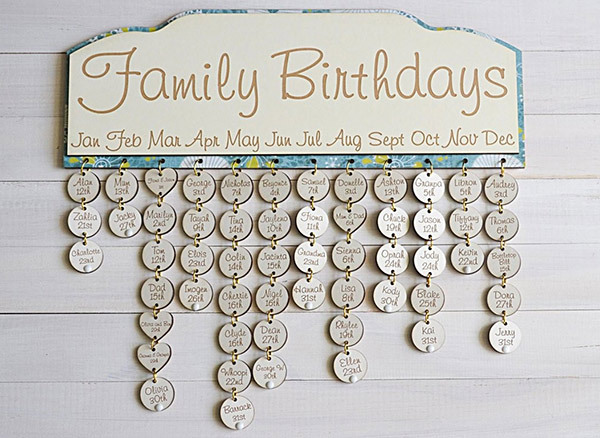 A wooden plaque and fifteen tags are laser cut and engraved with your family members’ names to link to their birthday month and additional tags are available for purchase for all new arrivals. The Family Birthday Calendar is priced $55 from Not In Shops. Traditionally reserved as the go-to artist for the most awesome kids’ prints, Laura Blythman recently launched this print – and I think it’s the perfect thing to put a smile on mum’s face at the end of the day – especially one of those days. 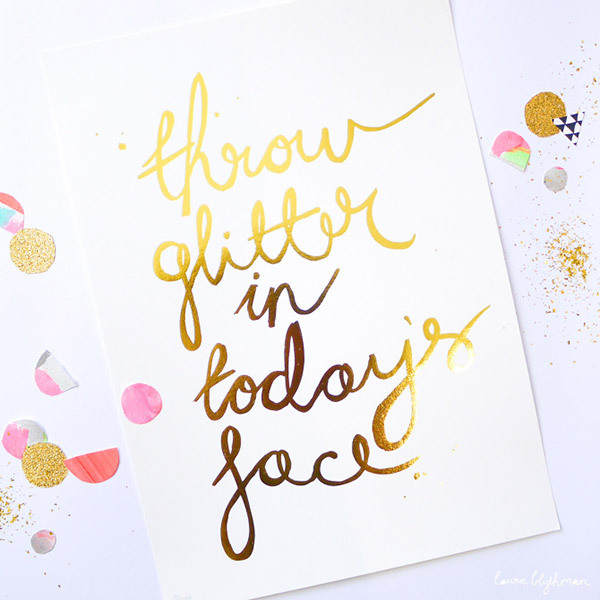 Throw Glitter In Today’s Face A3 print in all its sparkly gold foil lettering finery is priced $75 from Laura Blythman. A modern take on the traditional family tree, this monochromatic ink branched tree fits effortlessly into any contemporary space as a piece of decorative art. Only closer inspection of the stunning silver medallions reveals that it is in fact, a Family Tree. 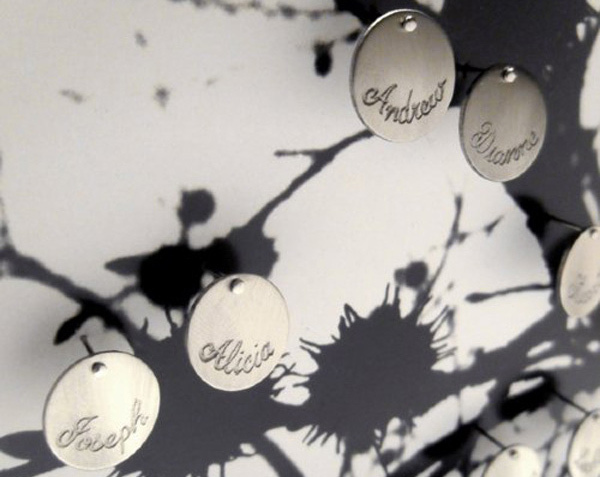 Each family member can have their name or initials engraved on a medallion and fastened to the artwork. Housed in a beautiful timber frame and set behind glass, the Family Tree is available in sizes to suit big and small families, priced from $75 from Bilingual. 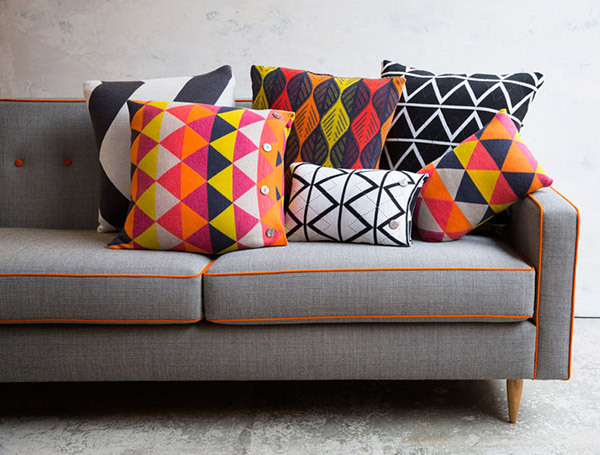 A couch can never have enough cushions and the stellar Uimi collection make a luxe treat for both the couch and mum! 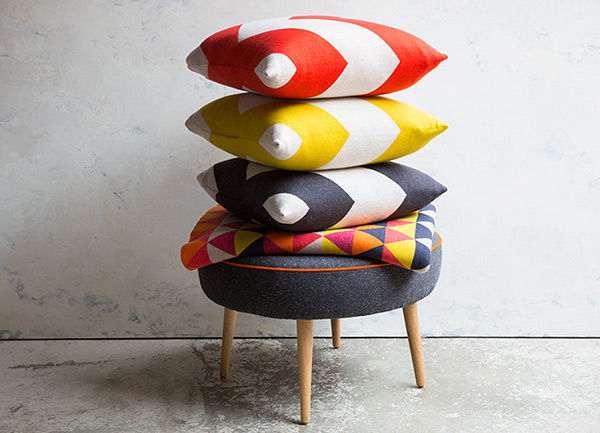 Uimi’s winter 2014 range is full of rich, bold colour, made from premium Merino wool, they’re perfect for refreshing a living or bedroom space. Priced from $130 (though if you’re quick some styles are currently on sale), you can get yours at Southwood. Mother’s Day lunch is a tradition in many Australian homes, so something to dress up the table might be appreciated, even if only to distract from the fact that Mum has to cook. 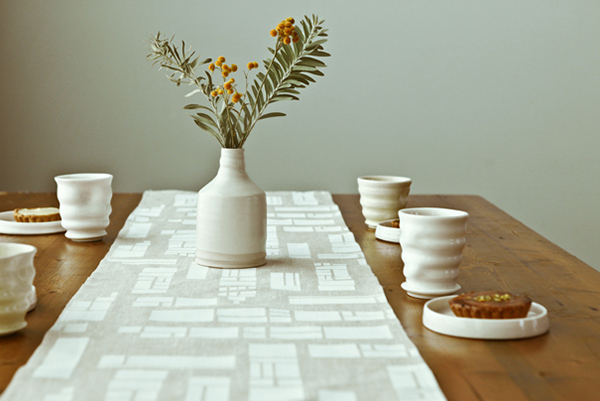 We’re loving this screenprinted table runner from Me and Amber. 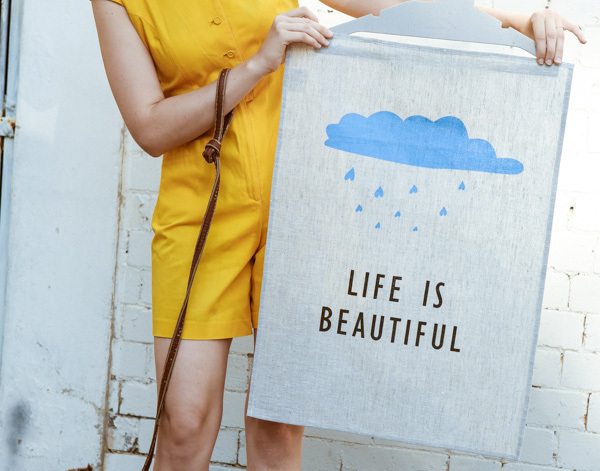 Made here in Australia from pure linen, it’s simple and elegant, just like so many mums we know. The Skyline table runner costs $90 at Me and Amber. After any lunch, there’s always the washing up, and we’re sure there’s quite a few practical mums who might like the gift of a terribly cool tea towel. This one’s also from Me and Amber and costs $29. What mum sometimes doesn’t need reminding in amongst all the drudgery of dirty nappies and dirty dishes that life as a mother, indeed, is beautiful. Finally, a candle with a cause. Glasshouse Fragrance have collaborated with the McGrath Foundation and released a deliciously sweet candle – Birds Of A Feather. Encased in fuchsia glass this pink lemonade scent is a feast for the senses indeed. Five percent of each sale is donated to the McGrath Foundation to help fund McGrath Breast Care Nurses in communities and increase breast awareness all over Australia. 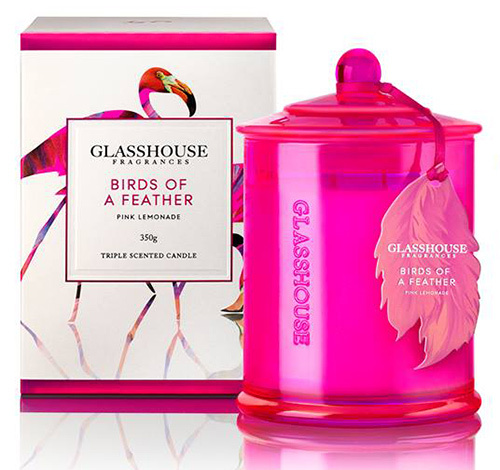 The limited edition Birds Of A Feather Candle is priced $42.95 from Glasshouse Fragrances.